Peritoneal dialysis (PD) is the preferred chronic dialysis modality amongst pediatric patients. Peritonitis is a devastating complication of PD. Adult data demonstrates early onset peritonitis (EP) is associated with higher rates of subsequent peritonitis and technique failure. Limited data exists regarding EP in the pediatric population, here defined as peritonitis occurring within 60 days of catheter insertion. 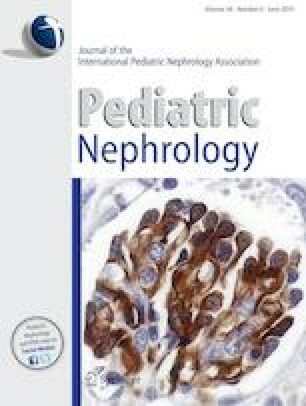 PD catheter insertion practices and EP episodes were examined from the Standardizing Care to Improve Outcomes in Pediatric End Stage Renal Disease (SCOPE) collaborative database. There were 98 episodes of EP amongst 1106 PD catheters inserted. Multivariable analysis demonstrated a significant association between early use of the PD catheter and EP (P = 0.001). Age less than 1 year at the time of catheter insertion (P < 0.001), first catheter placed (P < 0.001) for the patient, use of a plastic adapter (P = 0.003), placement of sutures at the exit site (ES) (P = 0.032), and dressing change prior to 7 days post-operatively (P < 0.001) were all significantly associated with early PD catheter use. Concurrent placement of a hemodialysis catheter was associated with a decreased risk for early PD catheter use (P = 0.010). In this large cohort of pediatric PD recipients, 8.4% of PD catheters were associated with the development of EP. The finding of an association between early use of the PD catheter and EP represents a potentially modifiable risk factor to reduce infection rates within this patient population. The Declaration of Helsinki was followed and the collaborative protocol was approved by the Institutional Review Board at each participating center. Informed consent was obtained where required by the institution’s Institutional Review Board.